Earn 4.8 SB per $ when you buy On The Border Mexican Grill & Cantina gift cards at MyGiftCardsPlus, powered by Swagbucks. 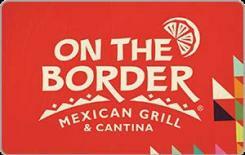 At On The Border Mexican Grill & Cantina®, we welcome you to enjoy "Border Style." It's fresh, simple ingredients and grilled over smoking mesquite wood. Itâ€™s margaritas made with only the best tequilas. And most importantly, itâ€™s our staff ready to ensure that you enjoy this way of eating as much as we do. We live for this food... welcome to it.